We are a registered installer of artificial grass from The Grass Factory and can professional install artificial grass in your garden for a no-mess, mowing-free, beautiful lawn. We offer a professional design service that is very sensibly priced. This means we can genuinely deliver an ‘start to finish’ service that gives you an imaginative yet practical bespoke design, construction, beautiful planting schemes and even subsequent maintenance if required. We provide a one stop garden service. 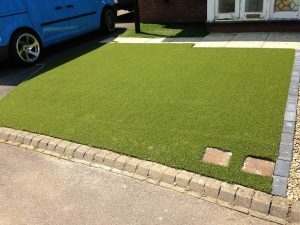 Importantly, we take care to ensure that your garden will be in keeping with your house and surroundings and that the final design meets the clients brief. We believe in creating at outdoor space that will provide an extension to the home, in doing this the client and the garden will be used as much as possible. An initial telephone discussion to establish your requirements. 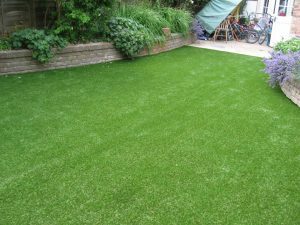 A meeting with Tom in your garden to discuss your detailed requirements and for us to make initial observations and recommendations. We make a small charge for this initial consultancy, usually £20. Following this meeting we send you a written brief summarising the garden style plus a checklist of the features you want included in the design. At this stage we will also provide a quote for undertaking survey work and for drawing up the garden plan. An initial garden design layout is produced and presented with the key purpose of ensuring that your requirements have been interpreted correctly With some key samples and pictures. At this consultation we will seek agreement to proceed to the final design stage. The final detailed design is produced and presented together with the invoice for the design service. We will of course be delighted to construct the garden and will produce a detailed quotation if invited to do so. As well as our own small scale designs we undertake many garden construction projects for established local Garden Designers to the very highest standard. I would personally recommend Tom and his team as they have helped me out on several occasions, most recently removing a Privet hedge from my backgarden. I have always found them very courteous and friendly.